A constant, unrelenting focus on the needs of our clients. A commitment to excellence and to constantly serving our clients. A belief in the strength of a team-based approach to the delivery of our services. An atmosphere that fosters creative and innovative thinking. The consequences of an accident are far-reaching and can last a lifetime. And when you’re not the individual who caused the accident, the suffering of these consequences is all the more impactful. The victim of an accident is no doubt in pain and worried about sorting out all the necessary details that it brings. Not to mention, a person’s life goes on despite such a harrowing ordeal, and they’re expected to maintain their normal obligations. The attorneys at St. Joe Law are compassionate and have helped countless clients to navigate through many difficult situations. Allowing us to handle the varying components of an accident gives our clients the space and peace of mind to focus on healing from their injuries. Some of the obvious stressors that a victim of an accident may be dealing with are seeing that proper medical treatment for injuries is received, missing work and losing income, and watching medical bills pile up. In addition, you may be trying to establish liability on behalf of the at-fault party, dealing with insurance adjustors, and trying to get your vehicle or other damaged property repaired. All of these things are overwhelming and can result in depression and uncertainty about your family’s future. Missouri case law grants victims of personal injury accidents the right to recover for medical bills and also receive compensation for lost wages, property damage, and pain and suffering. The attorneys at St. Joe Law understand the applicable laws and will advocate for our client’s best interests, ensuring their rights are protected and the best possible outcome is achieved. Specializing in auto accidents, medical malpractice, product liability, wrongful death claims and more, our esteemed and respected lawyers are aggressive and trial-tested -- and our results show it! To add even more peace of mind, the attorneys at St. Joe Law never receive a penny for their work, until a personal injury case is concluded. We take all the risk so our clients’ stress is minimized. In the beginning stages of an accident, the adjustors from the involved insurance companies will seem amenable and courteous, anxious to conclude a claim. But remember that the insurance company doesn’t have a layperson’s best interests at heart. Unless the victim has an experienced advocate representing their interests, there’s the risk of receiving compensation that’s far less than what’s warranted. Unless the insurance companies have the risk of a lawsuit in their future, they are far less inclined to be fair. But most cases don’t end up in litigation or a lawsuit. The majority of our claims are settled in a pre-litigation phase, saving our clients the nightmare of a lengthy court trial. We work diligently to conclude a personal injury claim in a fastidious, yet fair manner. However, if a case does end up in litigation, there’s not a better team of lawyers than the people at St. Joe Law to get the job done. We have hours upon hours of experience in the courtroom and within the paradigm of the court system. We understand what the court requires and have positive rapport with many of the folks within the court structure. We will bring this experience to a case in litigation and see that its promptly and generously concluded. From the onset of a personal injury case, our firm is committed to personal attention to each client. From the get go, we personally connect with our clients and get to know them as individuals, as well as their families. We take on their case as if it was our own or one of our family member’s. We’ll explain each and every step of someone’s case to them as we go and make sure they understand. We’re intent that each of our clients receive outstanding medical care and comes out of their case as close to whole as possible. At Murphy, Taylor, Siemens & Elliott P.C., tireless dedication is given to every single client. From attorney to file clerk, we work together as a team. As each individual in the firm brings their strengths and diligent work ethic to the table, we’re able to compassionately meet the needs of our clients. And this is why our firm has achieved great success in negotiating for our clients’ interests. Don’t delay in retaining the representation that you deserve. 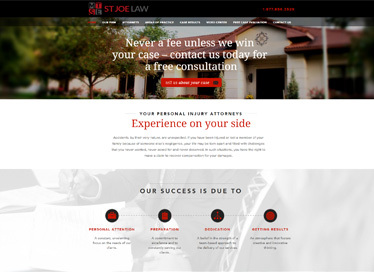 Call the St. Joe Law Firm today and we can bring our experience, dedication, and compassion to straightening out the complexities of your case. With the help of our attorneys, this ordeal can become less stressful and more healing for the victim of a personal injury and their family. "I know a couple of these attorneys pretty well. I'm impressed by the integrity of this firm as a whole and couldn't recommend them enough." "Being in an accident is bad enough, but the way the insurance companies treat you is just as bad. We worked with Mr. Creedy, it definitely help[ed] to have someone who knows the law in your corner." "Unyielding professionalism, consistent “can do” attitude, always a pleasure to work with." "Mrs. Bachman was always prepared for our court appearances and our meetings. I was always impressed by her ability to respond to any questions, concerns, or suggestions confidently and quickly." "I am extremely glad I chose Mr. Taylor and have NO hesitation in enlisting his services in the future. The staff in his office was always kind and efficient in helping me when I called or came in." "If you're seeking an individual who seeks justice and works for your interest, I have no reservations recommending Ben Creedy to meet your needs. Absolute class act..!" "I have worked with many attorneys in my professional career and have never been exposed to the level of professionalism and client satisfaction that I have seen with Ken Siemens." 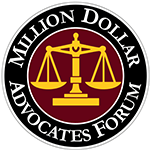 "I have been involved on the opposite side of Mr. Elliott in several litigation matters. In every case, Joe displayed professionalism, courtesy and knowledge of the law in the case. He is a credit to our profession." "I can not express how impressed I was with Mike and his practice. Mike's efforts, hard work and knowledge obtained me a very good outcome to my case." "When we take on your case, we take the time to get to know you. Whether that means meeting you in your home, visiting the scene of the accident, looking through family photos, or simply providing a shoulder to lean on, it’s important that we make a personal connection. You are more than a case to us; you are a person with a story." At the St. Joseph, Missouri law firm of Murphy, Taylor, Siemens & Elliott, P.C., you’ll find all this and more. Our attorneys are compassionate and caring people who understand the devastation that an accident can cause in a person’s life. We are deeply committed to the well-being of every client. We make sure you know what is going on in your case and keep you involved in the decision-making process. We are responsive to your calls and emails, keeping you informed and up-to-date about the progress of your case. Our partners have a long and successful history of helping injured and bereaved clients who have suffered losses as a result of someone else’s negligence. In fact, we have more than a hundred years of combined experience and have helped thousands of clients overcome the financial hardship of a tragic injury or death. We are not only skilled negotiators; we are effective trial lawyers who are comfortable in the courtroom. Most cases can be settled out of court, but the insurance companies know that we will be fully prepared to present a powerful case to a jury.